Harbor director kicked off the series to expand resident’s knowledge of harbor operations. 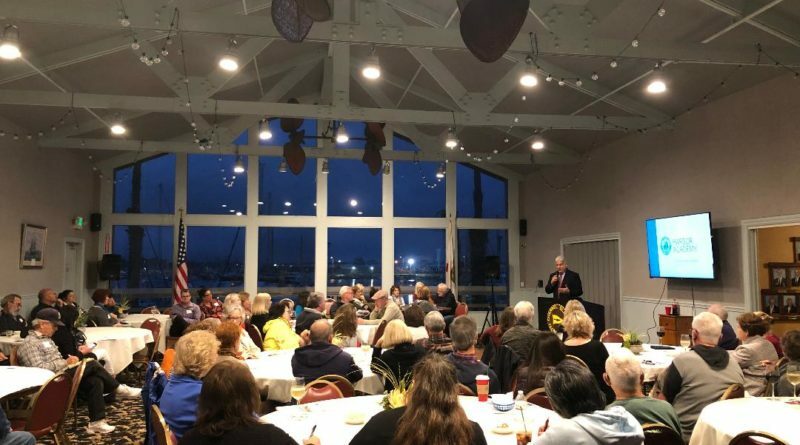 OXNARD—About 80 area residents attended the first in a series of five sessions of the new Channel Islands Harbor Academy at Channel Islands Yacht Club, Feb. 28. Channel Islands Harbor Director Mark Sandoval and staff created the Harbor Academy as an outreach effort to educate residents about the Ventura County Harbor Department operations and to address key issues. Each of the five planned sessions are to address different areas of harbor operations, including harbor history and finance, harbor development and planning, the Channel Islands Boating Center, harbor patrol and maintenance, and harbor marketing and promotion. “I approached this series of presentations with a little trepidation, knowing the passion for certain topics in the harbor. I was wondering if I was heading into the lion’s den dressed as a tri-tip,” stated Sandoval. In a follow up message on the harbor’s website, Sandoval said he thought the first session was a successful presentation, which included some spirited give and take. Sandoval, in the first session, presented a brief history of the harbor’s development and how harbor projects are financed. Ventura County and the City of Oxnard entered into an annexation agreement in 1963. The agreement called for a separation of responsibilities. Oxnard would be in charge of creating and maintaining public parks, parking lots, lighting, landscaping, sewers, and restrooms, while the county was charged with overseeing harbor operations, development, and planning and lease management. Sandoval explained, when the harbor was developed, it was decided to work as a ‘pay as you go’ operation – meaning, no county, or harbor money would be used for development. “There is a misperception that there is a ‘harbor tax’ charged to the retail establishments in the harbor. This is not the case. Consistent in the commercial retail industry, we charge rent for the operations in the harbor. That rent is in the form of a percentage of gross revenue of the business, again consistent in the industry,” explained Sandoval. In the finance portion of the presentation, Sandoval went through the current budget and compared it to what is needed for all the projects planned. “The Harbor Department currently has $9 million of available reserves to fund public capital needs in the harbor. Unfortunately, the list of capital projects currently totals an estimated $23 million,” stated Sandoval. Sandoval pointed out the budget has further been challenged since the city of Oxnard stopped maintaining the public spaces since October 2018, as a revised agreement to replace the expired one has not been approved. The city continues to receive taxes and other revenues slated for harbor maintenance. Since then, harbor staff has taken on the maintenance duties with the hit to the budget for 2019 at $500,000. According to Sandoval, to keep harbor development moving forward current plans include, taking the long-shuttered Whale’s Tail Restaurant property lease to the Board of Supervisors in April, with construction activity to begin shortly after. Fresco II Restaurant will take on this new lease. “The three projects on the peninsula (on the harbor’s east side), the Hyatt House Hotel and Restaurant, the Peninsula Yacht Anchorage Marina and the County revetment project are all finishing the permitting process. We are still negotiating shared area expense issues and schedule coordination between all parties, and anticipate seeing the construction on Peninsula Road to begin in the next few months,” said Sandoval. The next session for the Academy workshop, with focus on Planning and Development, will be held April 4 from 6:00 to 8:00 p.m. at Pacific Corinthian Yacht Club (2600 Harbor Boulevard, Channel Islands Harbor). To register to attend the April 4 session, use this link: bit.ly/2THFKY0. To watch the first session go to: bit.ly/2HtijLw. ← When will Fisherman’s Village in Marina del Rey see a revitalization?